A very detailed tutorial on everything rice paste: a full recipe and process of making, tips and tricks, making rice paste David Austin rose and classic open rose out of rice paste. 7 full HD video lessons. Can be accessed from everywhere on all devices. A recipe of rice paste with a summary of all tips and tricks and a class material worksheet. Very detailed instructions in close-ups. Responses from the instructor to all questions. As the founder of the medium, Jessica MV will show you how to make rice paste from scratch with detailed explanations on all authentic tips to work with it. 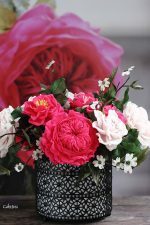 You can also learn how to make a giant David Austin rose and an open rose with rose leaves out of rice paste using a variety of techniques in flower making from basic to advanced including shaping, assembling, dusting, glazing and many more…. How can I download the recipe? Really enjoyed your tutorials. 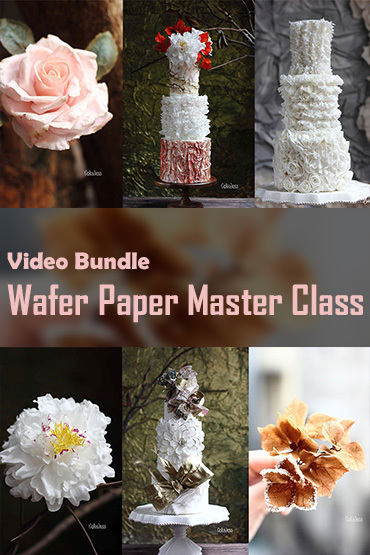 I have been looking for the perfect medium to make sugar flowers in very high humidity. I used gumpaste and it was a nightmare even with added tylose. Can I use icing sugar instead in the rice paste recipe please? An excellent tutorial Jessica. I'm am so excited to try make the recipe and make these flowers. Your instructions are very clear. Thank you for putting out this online course for us who cannot be present at your workshops. Hopefully meet you someday. How can I see video lessons? Log in your account, click on the course you already bought & click on the lesson you want to watch in the lesson list. Hi miss jess you only have rice paste recipe to purchase how about the gumpaste recipe can we also ourchade that? 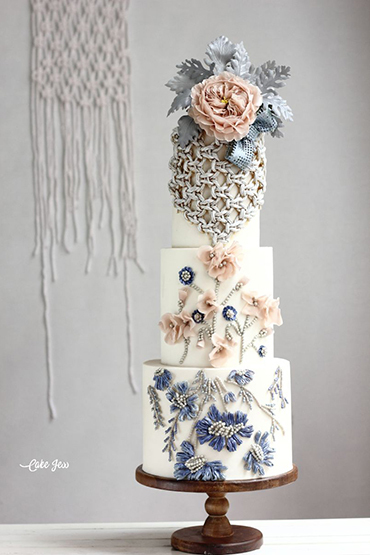 The one that you use for the sugar flowers? Hi Jess. I have just purchased the amazing Rice paste flower tutorial and I am very impressed with how clear your instructions are. 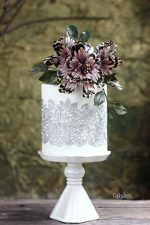 I can’t wait to try making the paste and the flowers in the tutorial. Thank you for doing the on-line courses for us who cannot make it to your workshops. Hopefully you will come to Australia and teach here. Cheers. Thank you so very much!Hope to see you in person! 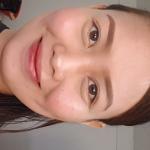 Enjoy your time with cakejess.com! 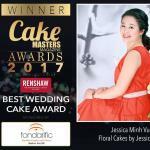 Hello CakeJess- very interested in your rice paste flower class. My question is are the supplies you need to make the rice paste easily available in most markets. I live in the USA. I do use NL gumpaste recipe but the tylose has to be ordered online since no local store carry it. At least I can easily order it with other items at reasonable cost. Yes you can order all the flours on Amazon. It’s available at food stores too. will you also be teaching the burnt rose technigue? 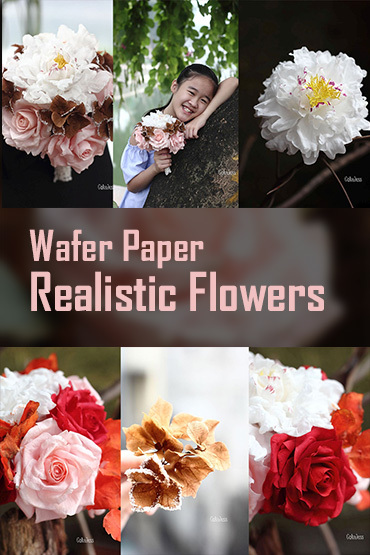 Hi Jess, I’m very interested in purchasing and learning how to make the realistic, beautiful rice paste flowers. Can the flowers be made in advance and what is the shelf life and can they be stored while keeping their texture without drying out? We can definitely make rice paste flowers in advance and in perfect conditions ( stable weather, not exposing to dust…), it will stay beautiful for years. In dry weather, it will dry hard like gum paste flowers; in humidity, it will become flexible and not be easy to break without melting or collapsing like gumpaste. Hi Jess- How do you “set” the color on the flowers using Rice Paste? When you use gumpaste you can lightly steam them so the color dust does not stain/rub off on your cake etc. Please advise. We can do the same for rice paste flowers. After dusting, you can steam them. My rice paste rose bud (the bud to start a rose) is cracking. What am I doing wrong? It is because the outside dries fast and the inside is still soft. For the buds, I recommend to use styrofoam. Can I use flavoured icing sugar in the rice paste instead of caster sugar? 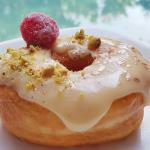 I have some really delicious flavour ones like lemon drizzle, pina colada etc. Thanks. Hi Jessica. Thank you for the rice paste class. Can the paste be frozen and if so what is the shelf life? Yes, it should be vacuum sealed and then can be frozen for few months. Vaccum sealed!? Maybe that is what I should have done because I only wrapped it and put it in a plastic bag. When I used it after freezing it, all the petals cracked after drying. I have not frozen my paste since then. It cracks not because you put it into the freezer. It’s because of the extreme dryness in where you work. Thank you. How long do the flowers last once they are dry? Hi, can the flower be done without the pasta roller? I do not have one. Hi Jess. I am really happy about the rice paste because it is so much easier to use than gumpaste! It rolls out easily, takes colour beautifully, can be rolled out thin as well as it curls a little. I did nitice that it’s not the best though for certain petails which I don’t want to curls, like the tulip so I use gumpaste. Is there a particular reason why you use gumpaste as well as rice paste? I have only one struggle, that is, the petals are really fragile, extremely so after they are dry. Is there something I can do? I have been breaking a lot of petals even while trying to dust with colour. Is your place very dry? Rice paste flowers become more fragile in extreme dryness, so we need to avoid putting it in baking room or air-conditioned room. You need to follow my recipe & process of cooking strictly, the petals will not curl. You can make any flowers either with curls or not. 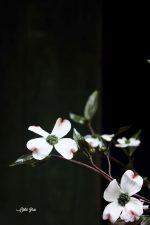 But the petals may distort if it is put in extreme dryness. Can I use cornstarch or wheat starch instead of potato starch? You can use wheat starch but corn starch will make the paste more fragile. Hi Jess, I love your rice paste tutorial and how wonderful and easy it is to work with your recipe. My question is, perhaps because of the quality of glutinous rice flour I can access with, my flowers becomes off-white when they dry. How can I make them whiter? Thank you! 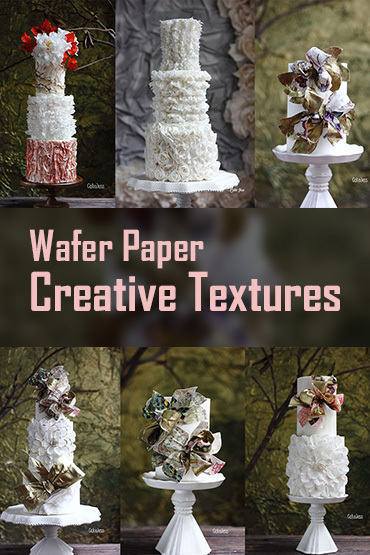 I have purchased your wafer paper and I’m excited for the video to come out! Lots of love! Anyway, there’s a kind of whitener possibly used in pastry called titanium dioxide but I love the rice paste pale white shade & I have never used that whitener so I can’t give you an advice on how to use it; but if you just want the white shade similarly to gum paste, you may try that thing. I am interested in purchasing this module. But I have 1 question. 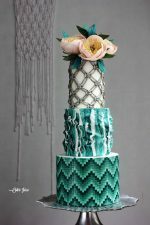 Are you teaching how to make edible lace as well in this module? No, I only teach bean paste lace, not rice paste one. In this class, you will learn to make rice paste as a flower paste then learn 2 flowers out of rice paste: David Austin rose & open rose. The videos are amazing! Very clear instructions and no shortcuts. Thank you for responding right away with my issue! hi Jessica, I am going to purchase the rice paste and flower techniques tutorial. I just want to ask you if we can make lace also with rice paste. No, rice paste lace is quite fragile.